Arcon Builders of Arcanum delivered 30 pizzas Tuesday to unpaid federal workers at Dayton International Airport. Pictured are Ray Mervar (left) and Alec Shellabarger (right). ARCANUM — The owners and employees of one local business took steps Tuesday to show their appreciation to workers affected by the federal government shutdown. 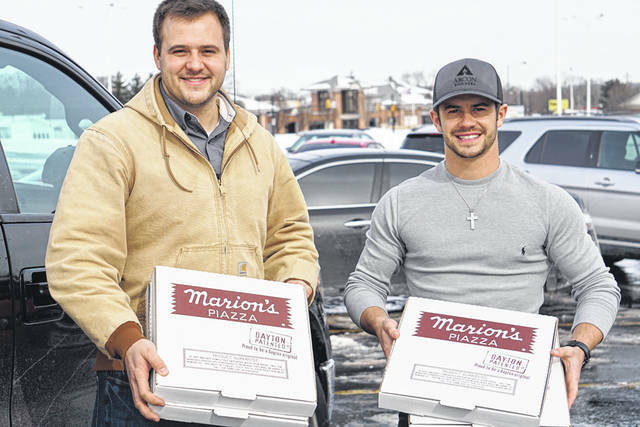 Alec Shellabarger and Ray Mervar of Arcon Builders of Arcanum delivered 30 pizzas from Marion’s Piazza in Englewood to unpaid TSA and air traffic controllers at the Dayton International Airport. Barb Slaven of Arcanum, a retired government employee and a friend of the company owners, brought the idea to their attention. Arcon Builders, Ltd., 7824 State Route Alt. 49, Arcanum has been in business for 34 years and was started by the brother team Rob and Tim Shellabarger. The current owners are Tim Shellabarger, Dale Lyme, Greg Shellabarger, Lane Shellabarger and Alec Shellabarger. The business employs 24 workers. For more information about the business, visit www.arconbuilders.com. This entry was tagged Air traffic controllers, Arcanum, Arcon Builders, Dayton, Dayton International Airport, government, Pizza, Shutdown, TSA. Bookmark the permalink.